N'Chwaning 2 Mine. Kalahari Manganese fields, South Africa. 30mm x 30mm x 15mm. N'Chwaning 2 Mine, Kalahari Manganese Fields, South Africa. 30mm x 35mm x 15mm. 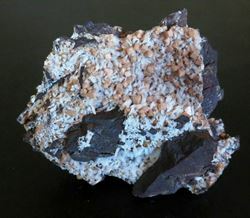 N'Chwaning 2 Mine, Kalahari manganese Fields, South Africa. 70mm x 70mm x 20mm.